"The geography of Scotland is highly varied, from rural lowlands to barren uplands, and from large cities to uninhabited islands. Located in Northern Europe, Scotland comprises the northern one third of the island of Great Britain as well as 790 surrounding islands encompassing the major archipelagoes of the Shetland Islands, Orkney Islands and the Inner and Outer Hebrides...."
Hadrian's Wall (Latin: Vallum Aelium) was a defensive fortification in Roman Britain, begun in AD 122 during the rule of emperor Hadrian. In addition to its military role, gates through the wall served as customs posts. A significant portion of the wall still exists and can be followed on foot along the Hadrian's Wall Path. It is the most popular tourist attraction in Northern England and was made a UNESCO World Heritage Site in 1987". 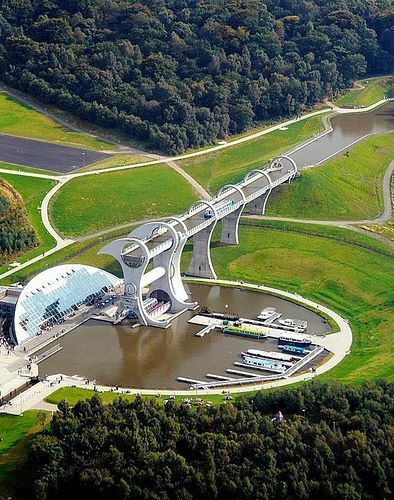 Falkirk Wheel = "a rotating boat lift connecting the Forth and Clyde Canal with the Union Canal. The difference in the levels of the two canals at the wheel is 24 metres..."